This is not a toy. Product is not intended for children. Drawstring and small parts present a hazard for children and pets. Prior to each use check that the silicone feet are secure, clean, and free from debris. Test silicone feet in a non-conspicuous area of the guitar to make sure finish is unaffected. Remove hand rest from instrument prior to placing the guitar in its case. Leaving it on and closing a tight case could damage your guitar. Make sure your guitar strap (if you use one) is secure on the endpin (typically the loop fits beneath the strap). If your strap slips off the endpin, you could drop your guitar, causing damage. If any part(s) of the hand rest become damaged, do not use. Check with your doctor or physical therapist about proper hand position and alignment. This is not a medical device. Lay guitar on a soft, flat surface, top side up. 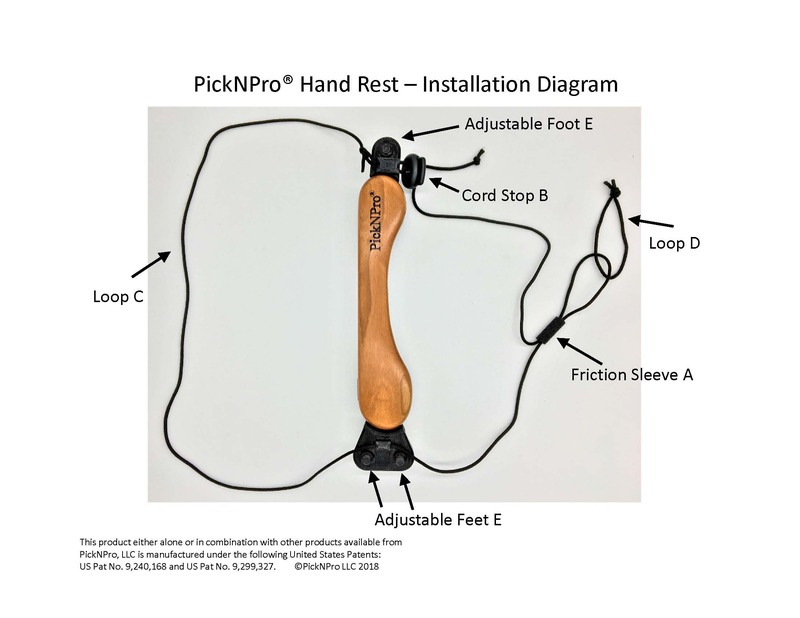 Loosen friction sleeve A and cord stop B as needed to adjust drawstring length. Place loop C of drawstring over neck of guitar and around the upper bouts (shoulders). Position hand rest in desired location (near sound hole, over bridge, etc.) with silicone feet resting on the guitar top. Place loop D of drawstring around end pin. If your guitar does not have an end pin (e.g., classical guitar), you'll need to order the optional strap to connect loop D to loop C along the back of the guitar. Adjust the height of the hand rest by gently rotating the silicone feet to advance the screw higher or lower. Make sure to leave enough of the screw threaded in the support to remain secure. Using the cord stop B, gently pull on individual sections of the drawstring to achieve the best length. Pull the cord stop against the hand rest to loosely attach hand rest. Slide friction sleeve A toward the hand rest to tighten the drawstring for a secure attachment. Do not over tighten. Loosen the drawstring by sliding the friction sleeve A away from the hand rest. 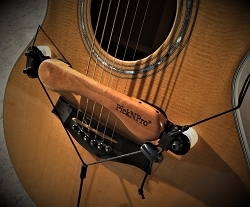 Lift hand rest over the upper bout and neck of guitar, adjusting cord stop as needed.